The co-director of the Caltech/MIT Voting Technology Project offers important questions that reporters should ask every local election official before the next vote. Q. How did you learn the things you know about how to run an election? The best answer would that they read everything they can and visit other jurisdictions, that they took a course from someplace like the Election Center and they attend the annual meetings of the International Association of Clerks, Recorders, Election Officials and Treasurers. It is also good if they say they talked to several different vendors, not just one. Most of them will talk about how they invented a process, software or training program, showing just how little best-of-breed standards have been developed for them to borrow from. There is no nationally accredited election-officials training program. Only 20 percent of the election officials have degrees from a university. So it’s important to ask your local officials how the arrived at their system. It is crucial that they feel they should take personal responsibility for how well the system works. Q. How are you making sure that people know how to register to vote? They might tell you about the “MotorVoter” law to make registration more convenient. Unfortunately some problems have occurred when various interest groups set up to register voters in public places -- they have been known to not always successfully register some of the people that think they have registered. The best registration process is to register at the registrar’s office, or to be very careful to attend to the registration card that must arrive after you have registered indicating the party you have effectively registered for. Q. How are you making sure people know if they have successfully registered? Registration is the biggest place where votes are lost. Do you have public information or registration drives? Some cynical voting officials have been known to do things that look partisan in their registration processes. Q. How are you making sure that any purges at the state level are not disenfranchising your voters? Some statewide registration systems have delayed or suspended registration after moves or drivers-license renewal, resolution of incarceration, or other changes. Q. How much faith are you putting in your vendors? Many officials are totally dependent on them for every aspect of the process. Q. How are you checking the vendors work? Officials have a lot of demands and might not have a good process for checking ballot layout, setup, ballot transfer, ballot counting, and data management. Q. How is the election certified? When? And is it certified by the same people who counted the first time? Q. Who on your staff is caring for the electronic process? (Because there’s always an electronic process at some point, no matter how you count the votes.) How is it backed up? Do you keep a copy in physical form (CD, etc). Do you keep a copy offsite? Using a second set of eyes is much better than using the same people for counting and certification. Some jurisdictions even hire accounting firms to certify the vote. Without two people looking at something, how do you know that one of them isn’t making a mistake? And the vendors are quite trustworthy – but who’s responsible for the integrity of the election? Is it the vendors? Vigilance is required but the biggest problem is not so much voter fraud. The biggest problem is getting people to vote at all. And everything that makes the voting process look inauthentic – if, for instance, people suspect that the opportunity for fraud exists – drives people away. Q. How long before the election are the ballots prepared? Who looks over them to make sure there are no errors? Q. How are they transported, and under what care (to the printer, to the polling places, to the counting places, to the storage facilities)? Q. How many people do you have try to vote using this ballot – as a test? How does that go? Ballot design errors are a problem everywhere. Q. Are the voting machines set up in a way so that their proper functioning is checked by more than one person? Q. How do voters know where to vote and which precinct to vote in? Q. What do you consider a long line? Q. How are you going to avoid them? Q. How are you going to keep people from campaigning illegally too close to the polling place? Typically lines get long when the people who are checking voters in get bollixed up somehow. 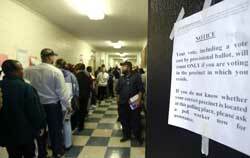 Sometimes parties will selectively challenge voters, making lines long. Misinformation about where to vote makes lines long. Poor processes at registration desks make lines long. Sometimes a voters might be stressed, confused or angry. You can have people intentionally require a lot of time and attention. You can have someone intentionally causing a disruption. Voting equipment can have troubles due to setup problems, training problems or technological breakdown. What you need to have is real good people checking voters in. They need to be efficient and organized. They need to separate the people who are making trouble from the people trying to vote. They need to be timely and careful about what they do when a voting machine has problem. Q. How are you planning to make particularly sure that you have competent pollworkers in the polling places where people might have the most difficulties (i.e. in areas with more elderly and disabled people, or more people who have limited educational backgrounds or trouble understanding English)? Poor, blighted areas tend to have the most problems on voting day. The best approach is to make potential pollworkers show that they can perform their tasks and give correct information before allowing them to take on the responsibility at a live polling place. Q. Do the people who are running the voting machines understand how the machines work? They should know everything they need to know in order to be able to solve problems on election day. Q. Are pollworkers trained in such a way that they are consistent in what they say to people? Election officials might not have a good way of getting good pollworkers – unless by some chance local reporters get out the news of how to become one and that they are needed. All training needs to include making each pollworker demonstrate that they can do the job. Pollworkers must know what they’re doing, must be comfortable and confident enough that they will take charge -- but must also follow established procedures meticulously. Improvising has no place in an election.